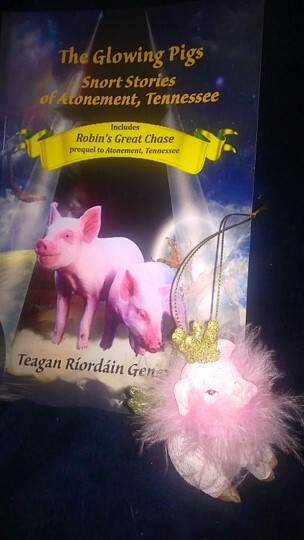 Posted on February 2, 2019 by Teagan R. Geneviene •	This entry was posted in Atonement in Bloom, Atonement TN - Features from, Character Interviews, Teagan's Books and tagged Atonement in Bloom, Chinese New Year, Chinese Zodiac, Pigs, Short Stories, Tennessee, Urban fantasy, Year of the Pig. Bookmark the permalink. Tee-hee! That they are, Suzanne. Happy Year of the Earth Pig! Mega hugs. Hi Andrea. I’m so pleased you enjoyed this interview. I don’t think I knew about the elements part until a couple of years ago. It adds another intriguing layer to the Chinese Zodiac. Love it! Great post! Have a great week!! Thank you kindly, Kirt. Have a thriving Thursday! Hugs. Teagan, I grunt-snuffle-snorted my way through this one. Won the mud wrestling contest? And Daryl from The Walking Bacon? Thanks for the laughs, my friend! Thanks so much for visiting. Hugs! Teagan, you are something else–so full of excitement and energy, good spirits and joy, It’s just fun being in your company: and a little zany too. Thank you. I hope everyone will visit it. I appreciate you taking time to visit here. Hugs on the wing. Glowing pigs and fortune cookies sound like an interesting mix for a short story taking place in Atonement! They say people born under the pig year are diligent, compassionate and generous. This should be a good year for them. That was so cute! I’m a metal pig: (supposedly) gentle, broad-minded, frank, helpful. How cool, Staci! There are several pig-year folks here, then. Thanks for taking time to visit. Happy Chinese New Year. Hugs! Happy year of the Pig, Teagan. Love those two! Thank you Jennie. Deme & Honeybell send grunt-snuffle-snort hugs! I appreciate your visits. Hugs! I am thinking about pigs too Teagan in a recent post – I didn’t realize it was the “year of the pig”. I love those animals – my brother use to have some in Hawaii and they were huge! Maybe one day you can share some photos of the animals. It sounds fun. I found two old pictures of my brother and his pigs and posted them on my blog and linked to this post. Fun! Fun! Fun! Early Happy Chinese New Year to you, too. Hope the new life is working out for you and all the drama was worth it. Huge Sunday Hugs! Hi, Christoph, it’s great to see 👀 you! I’m not there yet, but in a few weeks I’ll be in my high desert cottage. May the Earth Pig being us all wonderful times! 🐖🐖. Hugs on the wing. I didn’t realize there were element cycles as well as the zodiak, interesting! DH (darling hubby), my daughter and I are all year of the dragon, I always thought that was pretty neat. Enjoyed this interview Teagan, fun! LOL, you said it perfectly Rob. I think that’s what I strive for. I appreciate your specific feedback too. That’s really helpful to me. Considering your amazing image skills, I’m honored that you liked the image. Today I got caught up in Diana’s February image prompt. I did an image and a story. I’ll post it next Saturday. I think/hope you’ll like it. Tons of tidbit hints throughout it. I need to check out Diana’s prompt. I’m glad you got something from my comment. You bring the surreal to the fantastic. Hahahaha! I love a play on words, Resa. Thank you! I’m delighted that you enjoyed this. Hugs on the wing! Thank you kindly Michael. That means a lot to me. Happy weekend hugs! Oink, oink! Happy Year of the Pig to you as well! May we all live high on the hog! Tee-hee! I love it, Jan. Yes indeed! Happy Chinese New Year. Mega hugs! Adorable! These two are just too cute and so smart too! I love that you wrote about them for the Chinese New Year. I can’t decide which one I like best, but I think it’s Honeybell. She’s more conservative, while Deme knows no boundaries. 🙂 Great post, Teagan! Aw thank you, Jan. I’m happy the glowing pigs have a friend in you. Happy Chinese New Year! Hugs. Loved the interview, Teagan. Had to chuckle at the line ” Maybe that means you’ve finished a long cycle in life. Now you can start a better one.” Maybe Honeybell has knowledge beyond her years. Let’s hope so. Hugs. 🙂 Yes indeed, I sure hope so. Thanks for taking time to visit. Mega hugs! OMG This had me laughing so hard. “Have you seen The Walking Bacon? That Daryl makes me sizzle!” Ha ha ha ha. Great interview, Teagan. What a way to start my day. Happy Year of the Earth Pig. Thank you! Hi Diana. Your laughing, makes me grin. So thank *you* very much for visiting. That’s my twisting 3-things brain working… zombie + pig + hot guy = The Walking Bacon. Happy Lunar New Year (a little early) my friend. Mega hugs! and Happy Year of the Pig from us all! Thanks Greg! Honeybell saw me reading your post. Now she’s looking for a coupon for a free month of Netstyes. 😉 Thanks for visiting. Hugs on the wing. Happy Year of the Pig, Teagan, Deme, and Honeybell! Gruntle and Netstyes! The Walking Bacon? haha 🐷🐷 Gotta love these two. ❤ Enjoy your weekend. Thank goodness! Mary, I was beginning to wonder if anybody would pick up on that. I’m so glad you took time to visit. Happy Lunar New Year, my friend. Here’s to (i hope i hope) an early spring. Hugs on the wing. “You must be ancient.” That sounds like the kind of remark I would make. Those two are quite the little crew. Happy year of the Earth Pig, Teagan and I hope it does usher in a new wonderful cycle in your life! Thank you, Dan. I’m trying to be positive and see it that way, despite more snow. (Deme: Snort. You know how much snow Dan had. Don’t be a complainer. Sorry for the interruption, Dan. 😉 Yes, the pigs are a handful. But when they get too rowdy, all I have to do is mention bacon. Ha ha ha – pretty soon, winter will be that think that happened back there. No snow here for a while. Lovely, Teagan. I am glad I got a peep into the Year of the Pig celebration. Hi Robbie. Happy Chinese New Year (a little early)! Thanks for taking time to visit. Hugs on the wing. Thanks for reblogging, Patty. Mega hugs. I’m sure Honeybell is right about the future. Love the feature and you know I’m always happy to see Deme and Honeybell. Happy Year of the Pig all round! Thanks, Teagan! Heartfelt thanks, Olga. I’m happy the glowing pigs have a friend in you. Happy New Year and hugs on the wing! Thanks Sally. I’m glad Deme and Honeybell have a friend in you. Hugs on the wing. And they are positively glowing with pride now, dear Ape, to be featured at your tree-house. Heartfelt thanks for reblogging. Mega hugs! I was born in the earth pig year too! We’re astral twins Teagan. 😊 no wonder I fell in love with the magic pigs! Oh cool! It was a great year then! I’m delighted to know a twin. 😀 I’m so happy the pigs have a friend in you, Fraggle. I enjoy giving life to my inner rebel (Deme) and my inner book geek/ wannabe rebel (Honeybell) and their childlike mischievousness. Heartfelt thanks for taking time to visit. Mega hugs! Happy New Year to you too, Denise! It should, shouldn’t it! It’s about time too. 😉 Thanks for visiting. Hugs on the wing. Thank you for reblogging, dear Magician. Deme and Honeybell are so excited that they’re dancing. Hugs! Haha. Hi Carol. Deme and Honeybell aren’t huge fashionistas. Although they do have a weakness for pink boas. 😀 What a marvelous story! I love it! Hugs on pink wings! All the brilliant pigs yearning to be free!!! Hi Cindy. Thanks for sharing your gorgeous Yearning to Be Free post — poignant yet uplifting that that organization is helping. Deme is certainly a free spirit. She is a bad influence on Honeybell in the best possible way. LOL. Hugs on the wing!